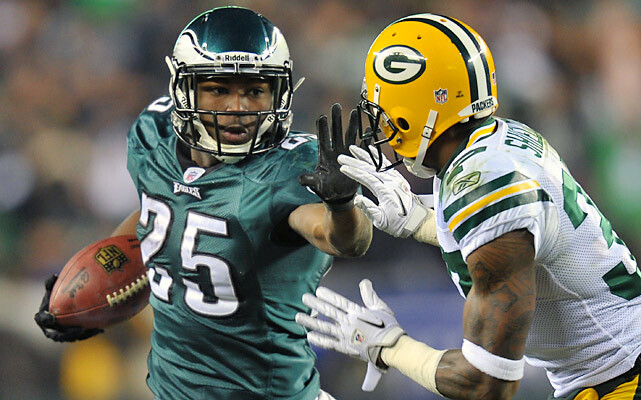 We came across an interesting article this morning about Philadelphia Eagles running back LeSean McCoy in the Philadelphia Sports Daily. The article makes a case for McCoy as the best back in the NFL, citing his 1,273 yards rushing, 17 touchdowns and 4.9 yards per carry this season. He’s also rushed for 82 first downs; no other back in the league has run for more than 63. In a year where the Browns have lacked playmakers on offense, it’s hard not to think back to the 2009 draft, when the Browns passed not once, not twice, but three times on selecting McCoy, who went to the Eagles in the second round with the 53rd pick. The Browns decided that, rather than McCoy, they’d rather have a wide receiver who will probably be out of the league next year (Brian Robiskie), a No. 4 wide receiver (Mohamed Massaquoi) and a linebacker who is no longer in the NFL (David Veikune). And there are people who still wonder why the Browns are in their current situation. Big news on the sanction front today as Liverpool’s Luis Suárez received an eight match ban and was fined £40,000 after being found guilty of misconduct for “using insulting words towards” Manchester United’s Patrice Evra. What, you thought we were talking about the slap on the wrist the NCAA game Ohio State? Suárez allegedly racially abused Evra “at least 10 times” during a match in October at Anfield. “We find it extraordinary that Luis can be found guilty on the word of Patrice Evra alone when no-one else on the field of play – including Evra’s own Manchester United teammates and all the match officials – heard the alleged conversation between the two players in a crowded Kop goalmouth while a corner kick was about to be taken. Just another case of their being one set of rules for Manchester United and one for everybody else. Not a huge surprise as it appears likely that Seneca Wallace will start again this week at quarterback for the Browns. That’s most likely for the best, as there is really no need to put McCoy back on the field unless he’s 100 percent recovered from his concussion. The Browns have plenty of film on him to help them make a decision in the off-season. In related news, the NFL announced today that trainers will be stationed at games effective immediately to monitor players for possible concussions. The trainer likely will be stationed somewhere in the press box of each stadium to monitor the game and assist the medical staff of both teams. Good to see the league put some action behind its words when it comes to dealing with concussions. After all, if they can have someone at each game worrying about the players’ socks, they can certainly have someone on hand to deal with something this important.